Receive updates when those listings are marked ripe, or commented on by the grower. You can subscribe to as many food items as you wish. Navigate to a produce listing page (you can find produce by searching on our map). Then click on Subscribe - that’s it, you’re done. To unsubscribe from any produce, click on the same button (you’ll notice it now says “Unsubscribe”, rather than “Subscribe”. Subscriptions also work like a bookmark or save-for-later feature. You can see all your subscriptions in you My Subscriptions page. To see who has subscribed to your produce, go to your My Produce page and click on "Subscribers" for the the listing/produce you'd like to view results for. 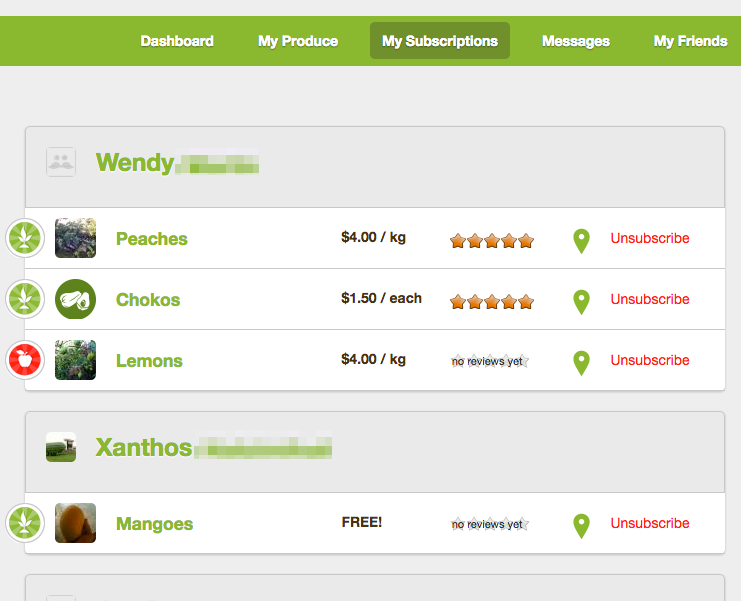 The listing page will display, and the subscribers tab will show a list of everyone who's subscribed to your produce. Of course, you can also navigate directly to this page and select the subscribers tab. If you'd like to send all your subscribers a message, the easiest way to do this is to post a comment on the produce listing page (the comment tab, next to the subscribers tab). An email will be sent to each subscriber making them aware of the update (you must have subscribers for this listing for notifications to be sent, of course). Note that this comment will display publicly, and will be sent to all your subscribers. If you'd prefer to send individual, private messages you can click on each subscriber separately and then click "send message" on their profile page.